Following on from my make-up post I thought I should give you an insight into the favourite products I have been loving this year, whether it is make up, skin care of hair care. Now to say I have a blog which is on beauty as well, I'm not that type of person who goes out and buys loads of new products and different makes to try I tend to stick with the ones I know I like. However I am getting better at it and as the new year roles in, there are things new things that have caught my eye for me to put to the test. I have become quite a fan of Soap and Glory, it has to be the packaging more than anything which draws me in to it, probably because it is so pink and girly. The product I use the most out of this range is the Clean on Me shower gel, I have quite sensitive skin so I am always careful with what I use, but this shower gel is so soft, creamy and delicate for my skin. Plus it hasn't got the strong perfume smell to it which always puts me off products. It has to be said Sudocreme is my savour! I suffer with spots all the time, it is super annoying and one always appears when I have to go somewhere important or a night out. I put a little bit of sudocreme on my spot and leave it on over night, it will reduce the redness and dries the spot up a little bit, however I cannot say it will work for everybody but its worth a try. Aveeno cream is just my go to daily moisturiser, as I mentioned before I tend to stick with what I know, I did get this prescribed from the doctors when I was younger for the stretch marks which decided to appear on my skin, it is so good as getting rid of the redness but I always moisturise my legs with it when I have shaved them. I have actually already done a post on these two hair products, it was one of my first ones here and here. 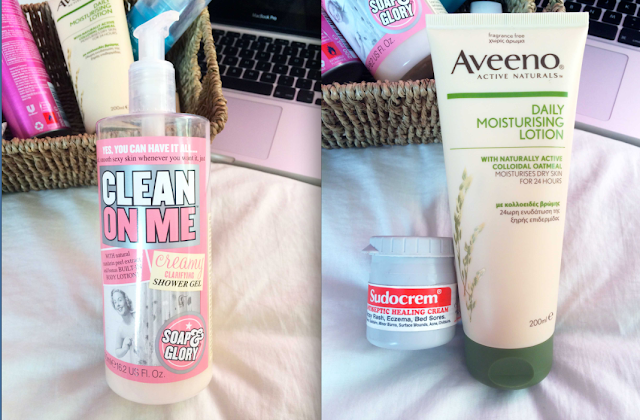 I am not the only girl who loves a bit of volume when it comes to hair and these are new products which I have picked up in recent months which actually seem to work. The John Freida one I give it a bit of a spritz along my roots and the V05 Plump It Up dry shampoo I use depending on what my hair is like in a morning, it does work so much better than Batiste. The brush is the best thing to use to backcomb your hair, the bristles are quite rough so it gets a really good grip on your hair. I cannot quite remember where I got it from but you can pick them up from anywhere, Primark have them for £1 I think. 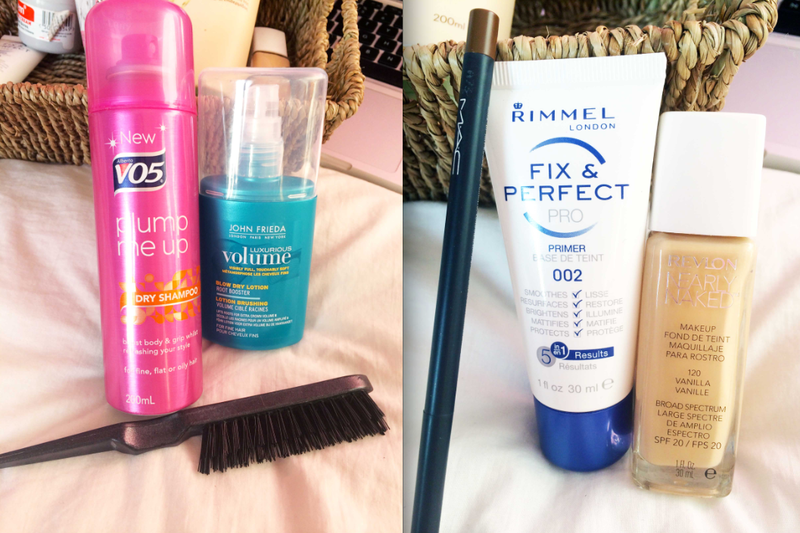 These make up products I have mentioned in the post I put up yesterday which can be seen here, I probably should have found a different product to write about but I am just so happy at how amazing the match is with the Revlon Nearly Naked foundation to my skin. It is quite a velvety substance and works wonders with the Real Technique Expert face brush, it blends in really nice. I must have been on a search for a primer the whole of this year, why I have not bought one before is beyond me and I am a little annoyed that I have not tried and tested different brands. This Rimmel one is so nice to use and I do feel that it is helping my skin cope with the amount of make up I wear as my spots are staying away (touch wood) and my face does not feel as dry. As for this eye brow pencil, well I could go on forever... 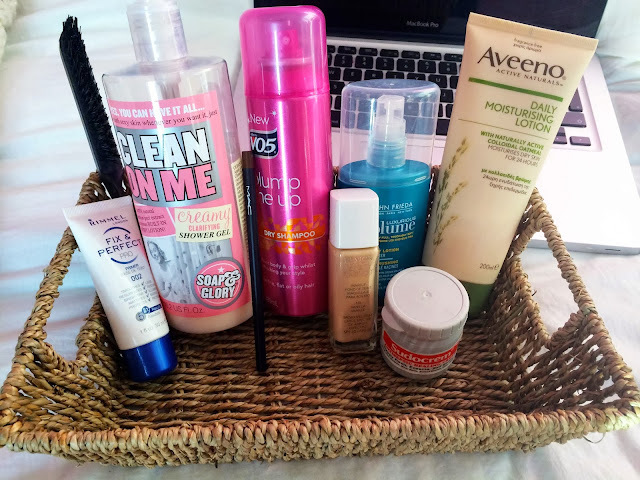 I have written about it here in my make up bag post. It is so easy to use, I know I say this about a lot of things but it really is, the end of the pencil is really small and it is really thin as well so you can get such good precision when drawing in your eyebrows. To say it is just a Brunette colour it is very dark, so you have to feel brave to wear it or go down a lighter shade if you would normally go for this colour.